If you can't see the world with new eyes, it's a good idea to change the position from which you see the world. I traded New York City for California - and not just another big city, but the California desert. It's given me a little perspective on the city I left behind, and more importantly, who I am when I'm there. Now that I'm in Joshua Tree, I often trade the Hi-Desert for an even higher elevation, climbing some crater or canyon or mountain to get a good look at the settlements and wilderness below. And when I climb, I pace myself. I only travel a mile or two, make an elevation change of two or three hundred feet. It means I can really get somewhere, get back to where I started, and still feel like I've done or seen something. Better still is when I know there's a respite from the sun and heat waiting for me, a green oasis from my fatigue and fears. I lean over railings and benches and overlooks without a barrier, trying not to fall. I drive my car in circles up mountains and canyons, leaning to the side in the spinning centrifuge, craning my neck to see the head-on collision before it comes around a blind curve. And then sometimes I hit a road block that's been cleared - just wide enough for me to get through. I stop and take a picture of it first so I can remember what I drove through. I duck my head down instinctively, though my car has low enough clearance to avoid scraping its roof against the narrowing rocks above. When I'm mid-way through, I pause as the rocks block the sun and it gets a little darker and a little cooler in my car. I giggle once I've cleared it. The road leads up to a canyon and is the only road that leads out. When I drive back through the rock clearing, it passes more quickly and more brightly than the first time. Or maybe it just looks that way from the reverse standpoint? I'm a little disappointed in myself that one of my happiest days so far on this trip was when I spent five hours by the pool at the Ace Hotel & Swim Club. I used to think Palm Springs was too populated. But the call of water is undeniable for me. I can't drink enough of it here. I sometimes shower three times a day. And even though I don't dare to swim in it, I keep dreaming about returning to the Salton Sea. Over the course of five hours at Ace, I would swim, dip, float, splash for a while, emerge and let my body evaporate in the heat, have a few sips of water, and get back in the pool. It felt warm like bath water, gently swaying from side to side. It irrigated my body with the slow drip of a date garden. Desert dwellers can't live without any water. I was thrilled today when I climbed the Andreas Canyon Trail in Indian Canyons to find a brook, maybe a creek or stream, running through the big palm oasis. Filling the silence of my solitude, it babbled for me, relaxing my sun-scrunched face and unsteady loose gravel legs to take the mile-long amble in triple-hot heat. In cooler seasons, the Indian Canyons - particularly Murray Canyon - are lush with waterfalls and streams, but it's so hot right now that they've all dried up, leaving my one lonely stream to trickle along the rocks and dampen the sandy soil just enough to let my sneaker tread grip into it. I would not fall; I would not get lost. Not with a water compass to follow, cross, and follow back. The green palms followed the water too. The temperature has crept up ever so slightly even in the higher elevation of Joshua Tree, making me sluggish during the day and keeping most of my meaningful activities to the early morning or twilight to night. I'm resisting naps. But I will answer water when it comes calling, and may just hose myself down tomorrow when I'm watering the other desert flowering plants. Who knows what I felt like I had to get away from today - the hi-desert is moving pretty slow now that the heat has hit - but I felt like getting out of town and taking a scenic drive. Having tired from the sore muscles, sweaty head and sunburn that has accompanied most of my excursions, I just felt like admiring the scenery, without necessarily having to climb up into it. There are plenty of scenic drives around here that I now know well: Pioneertown Road, Dillon Road, and Twentynine Palms Highway to name a few. But since Edith, Eric and Jon had all experienced the panoramic, harrowing, hairpin scenic byway through the San Bernardino National Forest and lived to tell the tale, I decided today was the day I'd take it on. Of course, I picked the easiest time to tackle it: no snow and no fires (though fire hazard today was posted as high). I started at the Palms to Pines segment on 243 from Banning, which rises quickly in elevation to reveal the valley below and the surrounding mountainous terrain. Plenty of colorful wildflowers were still out, especially at the higher elevations. Pops of yellow and purple bent towards the sun along the side of the winding road. A pop of red turned out to be a ladies' kitten heel shoe cast aside, though carefully positioned on a rock. The road is so dangerous, fluctuating from 55 mph speed limit to 30 at a moment's notice around a bend, with UPS trucks and school busses and RVs driving straight for you as they round a turn. I wasn't surprised to see this roadside memorial for someone who'd been killed along the way. I didn't find the familiarity of the forest, which reminded me of my childhood, comforting - only the drop in temperature. Although no fires were burning today, many areas were closed off for fire restoration. I felt a little lazy in my vehicular tourism, especially when I realized how many hiking trails there are in the forest. I passed trailhead after trailhead. I turned off onto 74 (technically the Pines to Palms segment) in Idyllwild, sneering at the Christian propaganda that was coming at me from all directions. The forest has some amazing vista points along the way, especially where you can see the evergreen landscape transition back into the desert. The last overlook at the border of the Santa Rosa and Mt. San Jacinto National Monument is a must-see. Just outside of Palm Desert, but still at a high elevation, the entire lo-desert looks like an oasis, a bright green patch in a land of sand and rock. I expected a camel to pose for a photo. I didn't have to look far for signs of American civilization. As the last vista point's view took my breath away, I was being encircled overhead. This guy was practically divebombing me. The flies must have told him about me. "Geez, a lot of flies, huh?" I'd been fighting them since visiting the Salton Sea and now we were surrounded by them at Pappy & Harriet's for dinner. "It's the horses," Carrie explained. "Oh thank God," I said, as relief relaxed my face. "Every time I've been on a hike and the flies start swarming around me, I want to scream at them, 'I'm not dead yet!'" I think I've probably avoided sweating too much in my life. Now that I'm in the desert - which is too hot for many tourists and residents alike this time of year - I'm trying to embrace the heat. Why else would I go hiking at noon on a triple-digit temperature day? But the more I sweat, and the more showers I have to take, the more rewarding I'm finding my experiences. I can't hide in an air conditioned car my entire time here. So I sleep with the window open, awakened by the heat that comes with the rising sun, and I throw the blankets off of me, exposing myself to whomever might walk by my room, exposing myself to life. When I get up in the morning for a hike, my insides are boiling but only my face sweats, running into my eyes, salting my lips. My nose does not run, though I sneeze in the heat. I wipe my forehead with the back of my wrist, and then my wrist on my dry cotton pants. A trickle runs off my chin and onto my light blue shirt, leaving not a drop as it evaporates immediately. I choose not to wear a sun hat because it makes my brain boil, collecting the sweat inside a smouldering pot on top of my head. I can't wait to get my sneakers off so I can empty them of sand and gravel and peel the sand-stained socks off my feet. Let the sun beat down on me. Let it turn my hair orange and my scalp pink. Freckles are emerging on my arms, chest and face, indelible to sunblock or sweat or soap. I sink myself into a pool whose water feels like a warm bath, slip my feet into hot potato flip flops, and recline my wet body down under a hot towel in some hot shade. My soul blisters, its true self bubbling up, shedding just a thin layer of skin when it pops, revealing a new naked soul underneath. I'm scratching at the surface, trying to peel it without injury. The desert - lo or hi - seems to be biker heaven. In Death Valley, often the only other people I would see would be bikers, usually riding in packs of three to five, waving as they rumbled by me on the side of the road taking pictures. Despite the more populated, commercialized nature of the Twentynine Palms Highway, which runs along the towns in the Morongo Basin including Joshua Tree, I still find bikers in my rear view mirror all the time. I find it comforting. They don't weave in and out of traffic, one minute cutting me off and the next minute passing me in the road shoulder. They ride patiently behind me, smiling if they catch my eye in my rear view mirror. I had to capture this guy, on my way back from eating lunch at the Route 62 Diner, adjacent to Hutchins Harley Davidson store. We were stopped at a red light but I wasn't quick enough, and had to push the button just after the light turned green and I started to pull away. When I turned into the left lane to pass the white truck in front of me, I lost him. The idea of running away has seemed to aspire everyone from Dion to Bon Jovi to Jefferson Starship. I threatened to run away from home many times as a child, cohorting with my sister and even writing runaway notes to our mother, saying things like, "You'll finally have Dad all to yourself." My sister would inevitably chicken out, leaving me to abort the plan altogether, too scared to execute it all on my own. I was probably ten years old. One time when cleaning our bedroom, our mother found one of our unused runaway notes. I don't remember how much screaming or crying we endured, or what kind of punishment ensued, but I remember that note including some of the truest words we ever uttered, as daughters, and as sisters. By the time I was 18., I didn't need to run away from home. My parents kicked me out. Ever since then, I always seem to be running away from something. Many people have asked whether my application to the Peace Corps was my attempt at running away from work, life. I told myself I was running towards something, but I don't think I really know the difference. It's all marketing, isn't it? I always thought I would put myself in the hands of another. Now I realize that's not going to happen. Since I arrived in the Hi Desert, I've only spent about half my time here. The rest of the time, I"ve been running off to Mojave, Amboy, Salton Sea, Palm Springs, anywhere I can go to put myself aside and focus on something else, someone else. But I'm wondering now whether I should make a more concerted effort to stay put, to be a local, to see myself in one place at one time and figure out what that is, and what the right place really is for me and my soul. I'm kind of losing a sense of self-consciousness out here. My hair has sprouted bright white roots and I don't really care, I just prop my sunglasses on top of them. Today I changed my pants in the Barker Dam parking lot in front of a couple families, women and children alike, not daintily like taking off my bra with my shirt still on, but full strip down to underwear and then redress. Earlier this week I wore a short skirt to the nail salon for a pedicure, and when they tried to cover me with a lemon yellow towel, I just said, "Oh please...."
I even say hi to every old, bearded, weathered guy with a hat that I walk by. New Yorkers would be appalled! It's a funny combination of desolation and society out here, and I'm having a bit of a hard time switching back and forth. 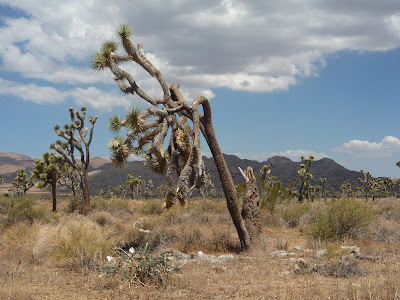 Even Joshua Tree Park - which you would think would offer a respite from commerce and industry - features a rich history of settlers' attempts at making the landscape more civilized, namely by building ranches, mills and mines. I'd stumbled across some of those abandoned mines on my Cottonwood Springs hike, but Jon had suggested I also check out Wall Street Mill, a protected historic site within the park that features, among other treasures, a largely in-tact stamp mill (for milling gold ore). When I first saw that access to it required another hike, I felt a little daunted (I mean, you can just drive up to stuff in Death Valley! ), but after I survived my various hikes over the last week, I was ready for the challenge. After all, I was already on a roll with all my ghost town excursions so far on this trip, why not one that's even more remote? Fortunately, this hike was accurately listed as "easy." In addition to the mill itself, which is cordoned off with barbed wire, the trail brings you past a windmill and a couple concrete foundations. In hot pursuit of a half-standing concrete building painted pink, I went off the main trail onto side trails that appear to have been old dirt roads (sort of blocked by a couple of tree stumps), not for mules and wagons, but cars. This historic site wasn't only from the Old West; this was a slice of 20th century industry! Signalling what I can only guess was the end of the Joshua Tree mining era, I saw at least two 1930s cars that had been driven off the side of the road to their final resting place, where they had rusted but, surprisingly, hadn't been invaded by the local wildlife, nor vandalized by hoodlums. About 300 mines, some even pre-dating the Gold Rush, were built in the area until the 1930s, when concerns about disrupting the wilderness helped designate Joshua Tree as a national monument (and 60 years later, a national park). But few of the businesses built in the wilderness were successful, and many of the ranchers, miners and homesteaders succumbed to the hot, dry desert and fled, leaving behind gravel pits, shafts, and tunnels for bats and explorers like myself. There's something less depressing about the abandoned mills and mines of Joshua Tree than towns like Amboy or Rice which fell victim to rerouted railroads and new highways diverting traffic away from them. The Joshua Tree settlers gave it a damn good try, and some (including William Keys) actually succeeded. Ultimately, they couldn't fight nature, but they lasted a long time, on some pretty unhabitable lands. No one can blame them for that. Kudos to them for knowing when it's time to leave. For more info on Joshua Tree National Park's abandoned mines, click here. Today I crossed one of the last items off my "to do" list that I'd been compiling since my February trip to Joshua Tree: Rice Ghost Town. I drove an hour and a half (stopping twice in construction-related blockades) to poke around a few abandoned buildings and listen for snake rattles. I wonder when I will allow myself to just be out here? When I first arrived I felt this sense of urgency, to not only see all the sights before it got too hot, but before I ran out of time. Now that I've made so much progress, I wonder if my mind and body will be able to settle, or if I'll feel the need to move on to more unfamiliarity, somewhere farther outside my comfort zone. In truth, there's something extremely comfortable about being out here. It wouldn't be unusual for Maria and I to spend an hour or two driving around Syracuse during one of my visits home. Sitting in Water Canyon all day working and writing, I recall all the time I spent at Happy Endings in the now-Armory Square area of Downtown Syracuse, before downtown was revitalized. This was when watching open mic night was a fun night out, and when the first guy I really dated (before Seth) lived at the Rescue Mission down the road. Ghost towns are starting to feel familiar and comfortable too. On those long drives upstate, when you get a little farther outside of the city, you see a lot of half-collapsed barns, shredded silos, and decrepit farmhouses. It's so commonplace that as a local, it never occurred to me to try to photograph or explore them. But now that I'm in the land of gold mines and salt mines and every kind of mine you can imagine, I'm drawn to those little towns that once were. The Salton Sea is the most extreme and sprawling example, but all over California you can find these little enclaves of broke-down houses, a gas station, and - like in Amboy - maybe a school or a church or a cemetery. Nestled in the Colorado Desert, Rice appears to be an old railroad community, adjacent to the Arizona California Railroad and not terribly far from the Arizona border. It's best known for two of its recent landmarks: a shoe tree (into which travellers passing through would launch their old shoes, boots, and sneakers) and the embankment of the railroad where travellers spell out their names in rocks and wood and whatever other debris they can find. The shoe tree "suspiciously" burned down so subsequent travellers have appropriated a chainlink fence to replace it. Signs everywhere point you to fresh jerky 36 miles down the road. Piles of junk surely house coils of rattlesnakes. And a capsized car circa 1960s bears some filthy graffiti and salt-stained tires. I could see a salt flat in the distance but couldn't figure out how to get there in my dinky car that prefers a paved road. On my way back I stumbled onto another ghost town which I think was New Dale, the newer iteration of Old Dale gold mining town that's closer to the highway. Old West ruins mixed in with 20th century abandoned trailers and houses for miles down CA-62. Most of the buildings were shacks or sheds, or just looked like wooden, windowless boxes, tossed out on either side of the highway like a paperboy's morning delivery. Most of their dirt access roads were untreaded for years, built up with drifting sand that I squished my flip flops into if I could even get that close. Once again, furniture and appliances everywhere. 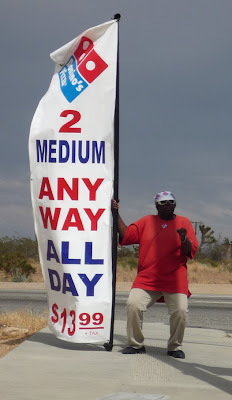 And then just a bit further down the road I was back in the Morongo Basin, ready for lunch and a cup of coffee. Tomorrow? Who knows. Maybe I'll get really uncomfortable and not do anything. I'll learn how to just be. I'm not very athletic. I'm not very hardy. I'm delicate and I cower from the sun. I faint and trip and get motion sickness and vertigo and cry when I encounter too many bees. So why on earth am I even in Joshua Tree, an outdoorsman's paradise? I do not climb rocks. I do not camp. But I do like to walk around and spot some wildlife, take photos, and admire a good view. That leaves me with hiking. I know I'm not good at it - I get lost easily - but I've decided to try to hike just about every day. Ever since climbing Amboy Crater and surviving a minor injury, I've felt encouraged to push myself further, to see how far I can go. At Cottonwood Springs and Thousand Palms Oasis, I had to turn around. I was determined to finish a trail today. I headed to Black Rock Canyon, where the High View Nature Trail is supposed to be easy. True to its name, it was high - the steep climb brought me up to an elevation of almost 4500 ft. Many times on my way up, I wondered if I could climb one more step, teeter on one more rock. But as I approached an increasingly elevated view of the valley below, and the diverse vegetation that I hadn't seen elsewhere in the park, I just kept going. I would worry about the climb down later. As my sunburned forehead dripped with sweat, and my 1.5 liter water bottle sloshed hot in my bag, I started to wonder why I even bothered. I thought of turning back at every step. But you have to test yourself in life. You have to see if you can run a minute faster or sing a note higher or carry a pound heavier. If you don't, how will you ever know what you're capable of? How will you know when the universe is speaking to you and not to some other person who's stronger and more resilient than you? New York City has tested me time and again, and although I think I passed, I got tired of taking its test. Was my life really about how manipulated I could be at work? How many guys could cheat on me? How many margaritas I could drink and still make it home OK? Where was all this resiliency getting me? I need to prove to myself that I can do something else. That I can embrace the unfamiliar and the solitary. That I can be surrounded by fallen, dead trees and still see the point of life. Soon it will be too hot for me to test myself physically while I'm here, but I see this trip as a mental challenge as much as a physical one. I'm not having fun every day. That's not the point. But I do feel inspired, awed, and just a little bit enlightened. When Edith and I took our hot air balloon ride in Temecula, it didn't really feel like the wind was pushing us. It felt more like we were riding the wind like a wave, using it to propel us forward (and up and down) with the steering guidance of our pilot, without whom we might have ended up in Oz (or Kansas). The wind is an essential element out here in the Coachella Valley. Along Interstate 10 where it meets CA-62, there are rows and rows of turbines whipping around, turning wind into energy, while road signs warn you of high gusts. But driving on 10, or Indian Ave, or Dillon, or any of the other surrounding roads and highways, it's nearly impossible to ride the wind. You have to fight it, because it's fighting you. It's blowing your car to the side when you're trying to drive forward. It's also nearly impossible to keep your windows open, even in the chill mornings or the cooling twilight, because the noise in your ear is deafening and the wind just might blow the contacts off of your eyeballs. Driving through wind like that isn't for the faint of heart. You swerve from side to side like a drunken driver, convinced you'll get pulled over and breathalized. Those of us from a colder climate can liken it to driving through snow, and those from the desert, to driving through sand: it's OK if you slide around a little as long as you proceed in the general direction of your destination. But what happens when you don't know where you're going? Driving with a GPS, sometimes you only know where you're going as far as the next turn. You don't get a broad perspective as to where you're heading, so if something goes wrong - you lose the satellite signal, a highway exit is closed, there's too much traffic - you're stuck. You can drive off willy-nilly and hope that the GPS can recalculate your route, but when everything including the wind is out to get you, to pass you by, sometimes you just want to give up and go home. Thankfully, out here, if you get blown off the road, you're likely to hit a soft shoulder (something the signs also warn you about, but relatively comforting in my mind). And if you can snake your way out of the drifting sand on the side of the road in your compact, two-wheel drive car, you're all set. So rather than drifting myself, going wherever the wind may take me, I feel like I'm fighting the wind, driving despite it. And although I don't know what every turn will be along the way, I kind of know where I'm heading. This weekend may include the longest day of the year, but this has been one of the shortest weeks I've had in a long time. Something shifted in me today. I started to think of The Desert Lily as home. And I started to look forward to going back to it at night rather than staying out to ramble. Our first trip to the Salton Sea was a little frustrating, because we'd heard about these sinking buildings, half submerged casinos, abandoned trucks, derelict trailers, but we didn't really find any of that. In fact, we didn't find much of anything except feathers, fish carcasses, and salt-stained driftwood. We drove through the grid of Salton City wondering why there were streets and even fire hydrants, but no houses. Turns out they'd never even been built. We were more prepared the second time and found more of what we were looking for - including some companionship at a local bar in Bombay Beach - but I knew there were more sights I was missing out on, as verified by photos in books and Flickr pools and travel articles that did not come with an accompanying map. After two visits, I was still on a treasure hunt, looking for a lost world that I was certain to find if I just kept going back. When I found out I had the chance to spend some time in Joshua Tree this summer, I knew that one of the first things I would have to do is go back to the Salton Sea. I'd added at least one or two markers to my own Google Map-in-progress and I wanted to skulk around some more before it was too hot and the air quality was too poor (from all that crap washed ashore getting kicked up by the wind) for me to do so. Fortunately, this weekend is also Save Our State Parks Weekend hosted by the California State Parks Foundation, so since part of the Salton Sea is a State Recreation Area, I could also wear green in support of keeping CA state parks open, take my picture in front of the Salton Sea sign, and get it included in a slideshow that's sent to the Governor's office. The one location I was sure I could find was the old Palms Motel in Salton Sea Beach, just north of Salton City. I'd seen enough photos to expect a ghost town of sorts, with furniture strewn everywhere, but I wasn't prepared for the flocks of pigeons living inside, the layers of their droppings on the ground, and the resulting stench. Mixed with the heat-induced funk of the sea, and what I'm certain were traces of human excrement, it was almost unbearable outside the motel, not to mention to actually walk through the rooms inside. A sign relatively recently posted outside warned that the structure was unsafe and not to be used by humans, but it looked stable enough to poke around and snap some shots. Nearby there were a number of abandoned trailers, most the old metal 1950s kind, permanently parked on the side of the road or in the middle of an empty plot. Some were empty themselves but others still showed signs of life - a television, a tape recorder, some old boots, even a bright turquoise stool, waiting for someone to take a seat and make the place their home. Since it rarely rains there, and the trailers were far enough from the water's edge, they weren't completely rusted out - just faded from the sun and disuse. Nobody even bothered to tag the trailers with graffiti. The closer I got to the water, the more human the ruins became. I came across what I can only guess was a marina, and most of the relics there were personal rather than commercial. I didn't see paddles or boat motors or tools or equipment. I saw shoes and leather shoulder bags and an empty box of Titleist golf balls. I guess I understand leaving a couch behind, but who wouldn't take these small items? In the wake of many natural disasters when people are forced to leave quickly (tornadoes, hurricanes), you find a lot of this kind of personal ephemera because it has become less important than saving your own life. What drove these Salton Beach residents and business owners out so quickly that they left a trail of their belongings behind them? Over time, garbage pickers and photographers and vandals and curious tourists have disturbed these abandoned locations enough so that they're not totally frozen in time. The once-popular and -glamorous resort town image is now shattered and scattered everywhere. I felt like a future archaelogist, trying to piece together the habits and lifestyles of a lost, modern society who'd just vanished from the earth. But instead of arrowheads and wall-markings, I found plastic containers and an old vacuum. Worse yet, the area's current residents seem to have given up completely and taken on the attributes of their surroundings. Among the occupied houses, you can find new trash - not remnants of a tragic mid-20th century resort town, but recently ditched possessions like a boat sticking out of the ground by a palm tree in front of someone's house, full of rocks, rendered useless, an oddly bright white addition to the rusty, sandy, tattered tableau. On the other side of the sea, just east of the last road in Bombay Beach, the sand rises up in high banks accessible only through two roads - one that looks impassible with a "Beach Closed" sign, and another paved one with a dangling chain swept to the side, allowing for easy entry. As I rose over the crest of the bank, I finally saw what I was really looking for: the land of sunken trailers. This was the holy grail for me, the area that had been flooded in the 1970s by a combination of unusual storms and aggressive irrigation runoff. Many of these beach towns are subject to flooding, but this had resulted in mass destruction, of biblical proportions. Having driven across a number of dry river beds and dry lakes, I could easily recognize this area as the one that suffered most when the Salton Sea swelled. The ground was overtaken by salty, mushy seabed. Unlike the hard, white salt flats of, say, Mirage Dry Lake or Badwater, this part of Bombay Beach felt new, as though the water could come back at any time, either from the sea itself or from the ground below. You can tell that the trailers parked here had been completely overtaken by the advancing water, and for the first time, I understood why its residents had to leave quickly. But unlike in Salton Beach, there were no belongings here. Perhaps they'd been washed out to sea, or picked off by fisherman, or buried themselves in the sandy soil that overtook everything else, even the boats. It was a graveyard of sorts, by far the deadest place I'd found in the entire Salton Sea area. And for the first time, I felt more than a morbid fascination with this apocalyptic setting. The abandonment was no longer a novelty. It was truly a tragedy, and as I walked away from my last photograph at the shoreline and my flip flops left their impression beneath me, I felt guilty for being there, for disturbing the area, for making any light of what these people must have gone through. After that I couldn't drive any farther south to Niland to visit Salvation Mountain, the most common tourist attraction in the Salton Sea area. I had to go back north up Route 111, back to life, back to opportunity and living. Still, the Sea wasn't completely abandoned. For the first time, I spotted other tourists roaming around in their cars, trying to get a look at what was left. The State Recreation Area was full of kids and families fishing, boating, and I swear getting ready to swim (something the state does not advise - not because of the water quality but because there is no, er, lifeguard on duty). Birds are still plentiful there and although I spotted a new tilapia die-off on one part of the North Shore beach, the Salton Sea is still a vibrant area for birdwatching and wildlife viewing. And not just pigeons, but a number of seabirds who seem to thrive in the heat, water, and salt. There is still life at the Salton Sea. But how long will it last? Today I drove all the way down to Cottonwood Springs, the southernmost entrance of Joshua Tree National Park, which was the first time I'd actually been to the park since arriving in the area Monday night. In February, Edith and I had only made it as far as the Red Ocotillo Patch, so knowing that there was a stretch of road that we hadn't covered, I wanted to go back. Besides, I like that part of the park - where the Mojave Desert transitions into the Colorado Desert - a little better than the rocky northern part, with granite upheavals from centuries of shifting earth movements. (That also happens to be where all the Joshua trees are.) On the Colorado end, there are more wide open spaces and interesting variations in plant life. There's also a dry river bed called the Pinto Basin where an early culture of hunters and gatherers called the Pintos lived. I stopped by the roadside educational exhibit about the Pintos and just sat in my car, reading the board about how different they were than the cultures that followed them, and how they and their traditions are now extinct. I've always thought of myself as a dying species - as the last known survivor of a vanished society. People study me but they never really understand. After a few moments, I headed back north, but by the time I reached the Cholla Garden, I was experiencing a full-blown breakdown. I don't know whether it was exhaustion from my Cottonwood hike (which I aborted less than halfway through) or the Fleetwood Mac song "Sara" playing on the car stereo, but I just lost it. Sobbing from behind my sunglasses, I didn't know whether to keep driving, to pull over, or to veer into oncoming traffic. So I decided not to decide. Which, thanks to inertia, meant I just kept driving. It has started to hit me during this trip: I don't miss New York City. I miss its familiarity, but I have no desire to go back. And the longer I'm here, the more I wonder whether this is the place for me, either. Being on vacation in Joshua Tree is different than living here, and as I talk to locals and entertain their curiosities about where I'm from and what I'm doing here, I still feel so alone, so out of place, so ... lost. Relaxation has not come. Relief from physical pain alludes me. And now my thoughts are turning on themselves. So what does that mean? Do I stay here for a while, treating it as a vacation, and then find another place outside of New York to camp out for a while? How do I find a place that will be my home? What does home even mean? Will I be happy living anywhere? Or...do I just not like living? After all, this crisis I'm in all started with a trip to Death Valley, and since then I've been to the Salton Sea - a place even deader than Death Valley - twice and am going back tomorrow. For what? I often feel like I'm dead already, a lost soul stuck between a life it can't give up and a death it doesn't understand, or is too scared to accept. I probably live more than the average person, but when I go on an adventure, it's as though I'm pinching myself, convincing myself that I really am awake and alive. After working for three hours in the coffee shop in the next town over, I mostly drove today. I'm still absorbing my surroundings. Armed with a GPS and a few Google Maps printouts, I felt brave enough to drive down roads until they just ended at the desert. So I would have to turn left or right to stay in civilization, but I could see the tire tracks from those before me who have kept going. When I first arrived at The Desert Lily in February, the dirt road up the Joshua Tree Highlands seemed impassable in my compact rental car. But I, too, had to keep going, even though it looked as though the road were ending. Now I lumber up and down Rincon Road at breakneck speed, ready to jettison myself out of the driver's seat at any moment. To be honest, no matter how cocky I get, it is dangerous in the desert. When you drive, signs warn you of all sorts of perils, from flash floods to tortoises to gusty winds, blowing sand and unexploded missiles (! ), not to mention all the chipmunks and roadrunners and lizards crossing the street. But you have to keep driving, whatever you do, even if you slow down for the little guys, just keep driving. You don't want to stop, out there in the middle of nowhere, if the road keeps on. And then sometimes you have to know when to stop, when continuing on will endanger the wilderness, endanger your life, or get you maimed or arrested. I took a relatively easy hike today in the Paul Wilhelm Grove at Thousand Palms Oasis, but a swarm of bees stopped me in my tracks. I had to turn around and go back. And then I had to tell myself that that was OK, and take a hike down another short trail. As I watch a jack rabbit nibbling its dinner off a nearby bush, a lizard doing push-ups on the gravel beside me, and a wasp buzzing behind my head, I'm not sure where my road will end or even what road I'm on right now. Whether I keep going straight or eventually have to turn right or left, I know that I will not turn back. For another account of today's drive, click here. "Did that lady come here all by herself?" I'd been waiting to hear that question all day, but it didn't come until I was driving away from Mitchell Caverns with the window down. For a second I considered stopping the car, turning my head and declaring, "I can hear you..." but instead I just kept driving. I'd been alone, really alone, all day, but it didn't bother me until that very moment, when I felt not loneliness, but humiliation. I always feel like I'm getting called out for flying solo. People feign being impressed but I think they're really just appalled, and bewildered. Alone in a bar? Eating dinner all by yourself? Didn't you have anybody you could come with? But this morning at 9 a.m., alone behind the steering wheel, careening down Amboy Road without another car in sight, I was happy. I suppose going to a notorious Route 66 ghost town to hike a volcanic cinder cone by yourself isn't the greatest idea, but I wanted to do it before it got too hot, and even today at 90 degrees it was a challenge. I'm not the most prepared outdoorswoman, so I went without a hat or a compass or something to wrangle rattlesnakes with. And as I tiptoed through the igneous trail, careful not to disturb any web-covered tarantula nests, I kept talking to myself out loud to get myself over the fear of treacherous desert predators. And I kept telling myself there was no way I was going to climb to the rim of that huge thing, which you can see easily from miles down the road. Then I got to the rim, and thought it didn't look so bad. And if I'd gone that far...That is, til I tripped and skinned my knee. The same knee I skinned in Morocco. And then I got to the top and looked inside. I realized the Amboy Crater was a lot taller than it was deep (unlike the crater in Death Valley), shrugged my shoulders, and attempted the trip back down. Inertia sent my sneakered feet sliding down the loose dirt and sandy terrain to the point where I had to sit-and-scoot just to proceed. The heat and fatigue were alleviated a bit by a Route 66 Root Beer from Roy's, the only standing business in Amboy, before I headed to Kelso Dunes. I was too exhausted to climb to the top, but I hiked a little bit, enough to fill my sneakers and the inside of my socks (!) with sand before returning to my car. I drove like a bat out of hell to get to the 1:30 p.m. tour of Mitchell Caverns, something I might not have risked with a passenger on board. I still arrived late, so I snuck into the group from the back and tried to assimilate as quickly as possible while my chest was heaving and my face was shedding sunscreen (which had become a solid after mixing with sand from the dunes). I had little control over my legs while climbing up to the cavern entrance (described by the Native Americans as "the eyes of the mountain") and slipped a couple of times, prompting retirees to offer me their arms and walking sticks. So what's so terrible about going to a cave alone? I was in a tour group. We had a tour guide. I wasn't alone at all. Still, the teenager who asked his mother about me as I drove off made me self-conscious, and I couldn't wait to get back to The Desert Lily where I could really be alone, rather than alone in a crowd. But not self-conscious enough to pass up a table-for-one at Pizza Hut on my way back. I'm back to where I started today, sitting outside my room at The Desert Lily facing east, except now rather than watching the sun slowly rise in a left-to-right arc across the sky, I'm gazing at the shadows cast by its setting behind me. Bob is gone now but I'm not alone: I've just met a young neighbor named Jimmy who sauntered around back like he lived here, and a young boy named Timmy who's staying at the B'iltmore, another house on the property. I spent most of today loving people. From the sideburned, pompadored guy at the Crossroads Cafe who told me where to get wireless to Orv, the enthusiastic California Welcome Center greeter, everyone has been so nice and helpful and friendly and interested and interesting. The checkout woman at Wal-Mart called me "sweetie" and "honey" and told me to have a good day and meant it. Still, I got a little tired of civilization. I took a drive up Pioneertown Road, past Pappy & Harriet's into the Pioneertown Mountains Preserve, on the other side of the Twentynine Palms Highway. I stopped to snap a photo of the rocky, green-dotted terrain and a truck drove up behind me and kindly waited for me to finish. After that, I didn't really see anybody else. The Preserve has been ravaged by wildfires, something I hadn't seen since last September's trip through Julian into Anza-Borrego. I couldn't even get all the way to the preserve headquarters because the road leading to Pipes Creek was closed. Even the rocks look burned. As dead as the joshua trees all around me were, charred and split down the middle, falling over and twisted, seeing them made me feel more alive than I had since I arrived the night before. Could I be a wilderness girl? I suppose so, as long as I have a car with air conditioning. I had no desire for my usual comforts today. I apathetically strolled down the snack aisle at the grocery store and didn't feel tempted by any cheese curl. I went to the movies and didn't get popcorn. I resisted the cookies in the kitchen and ate grapes for dinner. Instead, I feel comforted by the intensifying vibrato of crickets, and the moving image of the road passing underneath me in my head. I'll go to bed early again tonight and hope to wake up again around 6 a.m. to watch the sun rise. Out here, it seems to be enough reason to get up at all, something I struggle with every day back home.